A valid, signed US passport. The passport must have at least 6 months remaining after the completion of your stay in Mozambique. Must have at least 1 blank page for the visa. Amendment pages are excluded. For foreigners residing in U.S.A.: a copy of the residence permit/visa. 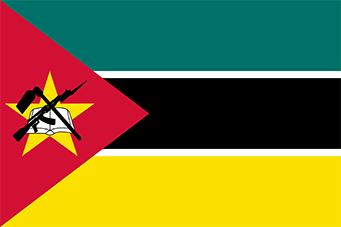 Fully completed and signed Mozambique Visa Application Fill in the visa application form properly (one color ink, blue or black).It is very important that you provide all the information required, including the name and address of your place of stay in Mozambique. Please be advised that lack of information may result in delay of your application. Additional documents may be required. Copy of round trip airline tickets or itinerary. Adequate funds for the duration of their stay in Mozambique. If the applicant has been in a Yellow Fever endemic country, the applicant must bring Yellow Fever Certificate when traveling. For Tourist Visas,a document to confirm the applicant’s address during his/her time in Mozambique. A copy of hotel reservation. For 18 years below:please provide a notarized parent’s consent by signed both parents and copy of birth certificate. For family and friends Visiting Visas,a term of responsibility passed by the person to be visited in Mozambique and recognized by the notary, if a foreigner, also attach the copy of DIRE. Photocopyof the passport bio page. For Business Visas,a business letter of invitation from the company in Mozambique – explaining the reasons of the trip and being responsible for the stay in Mozambique. For Diplomatic, Service/Official passports and Laissez-Passer (No Fee), a Note Verbal from the employer of the applicant. Applications submitted by mail which will not be retrieved directly at the Mission, please include a prepaid labeled return envelope preferably with a tracking number.